Face FRP lock problem in your Samsung SM-G6100, so welcome here today we will share with you latest method to Bypass Google FRP Samsung On7 (6) SM-G6100. If you hard reset your Samsung On7 (2016) then after the power on your device it will ask to verify old previously synced Gmail account then you will access yours On7 (6) home screen. here we share an easy method to bypass FRP Samsung SM-G6100 Samsung On7 (2016) is a 5.5inch capacitive touchscreen with 4G voLTE enabled smartphone and powered by SD625 processors and the GPU is Adreno 506 and this device has 32GB of ROM storage along with 3GB of RAM and supported up to a 256GB expandable memory card, Samsung On7 Pro runs on Android (6.0.1) Nougat operating system. On7 (6) has a 16MP single rear camera also has 16MP of single front selfie camera. 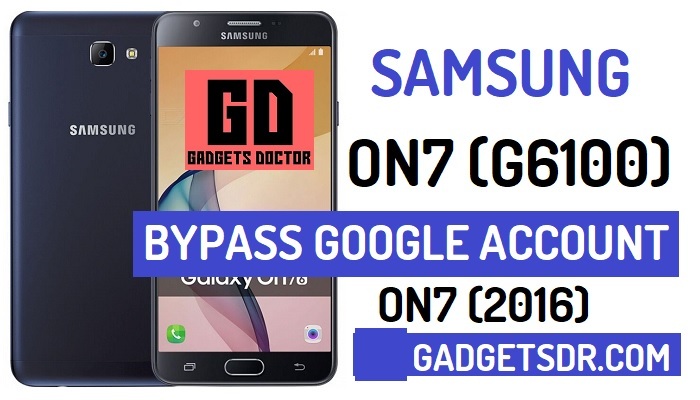 and the Battery power of this device is 4000mAH Li-ion battery, and if you owner of this device and want to Bypass Google FRP Samsung On7 Pro, then you are here on right place follow the below guide to add a new Gmail ID and bypass frp verification to access your device home screen. So follow the guide below. Warning:- This method is only for the Samsung On7 device owner. Note:- This method is successfully applied to my Samsung Galaxy On7 (SM-G6100).You can try and follow this method with your any Samsung On7 devices. We are not responsible for any damage on your Device. before you try this method backup your Full data and fully charge your device. In the latest security patch updates by Samsung, Samsung has Fixed all the old methods that help us to bypass FRP previous times like Bluetooth, Calculator Method to bypass Google Account… So here on this page, we Share the latest method only you a new Combination ROM and Stock Firmware and Odin tool to successfully Bypass Google Account on Samsung G6100. Download all files below to Bypass FRP Samsung Galaxy On7. In the latest security patch updates by Samsung, Samsung has updated all the security patch level to the next level, Samsung.Inc has fixed all the old method that helps you to bypass FRP Samsung G6100, Now Samsung has fixed and updated all the old security patch level. old Methods that help us – Talkback method, Calculator method, Bluetooth Method, all methods are now fixed and not working now. -First tap on “Next” from your device welcome screen. -Then connect your device to any wifi network connection. -After that, Download Samsung USB Driver on your PC. -Then install the Samsung USB Driver to your PC. -Now you need to Download FRP Tool to Bypass Google FRP Samsung On7 (SM-G6100). -After that, copy the downloaded files to your Desktop. -Then extract the downloaded files to the desktop, using 7Zip and Winrar. -Once extracting finished, open the extracted FRP tool folder. -On the “FRP tool” folder then there you will see “FRP-Tool.exe”. -Run the “FRP-Tool.exe” to your PC. -Then Connect your Samsung G6100 to PC. -Then again open the “FRP-tool.exe”. -After that, click on the “Scan” button from the “Comport” settings tab. -There you will see your device driver “Comport” version. -Okay, Then enter the mobile number from the “Calling Command” tab. -After adding any phone number, then click the “Call Now” tab. -Your device calling screen will be open. -After you cut the call, then there you see “Massage” icon. -Then tap on the “Massage” icon from there. -Now you will redirect to “Massage” tab. -Then on the message box type “www.google.com” and tap on “send” icon. -After that, “www.google.com” turn into blue color. -Just tap on the “www.google.com” once or two times. -After that, “Google Search” bar will open. -There search “Samsung Apps Store” again. -After that, open the first “Samsung Apps store” official website. -Then go down, then tap on the “Goto the Samsung apps” from there. -After that, galaxy app store will open. -Then tap on the “Search” icon from the top right corner of the Samsung App Store. -Then type and search “Samsung Internet Browser”. -After the search result come, tap and download “Samsung Internet Browser”. -Once downloading finished, tap on the “Open” button from there. -Now “Samsung Internet Browser” will open. -Now you need to download some files to Successfully Bypass FRP Samsung SM-G6100. -After the search results will come, open the first website. -Now there you will have the result of “Gadgetsdr.com” site on the top of your site result. just go to that site. -After that, go down and download “Google Account Manager 6.apk”. -Also, download from there “Quick Shortcut Maker.apk”. -Once downloaded, tap on the “Bookmarks” tab from the menu bar. -Then tap on “Downloaded history”. -There you will see your downloaded files. -A popup box will open – tap settings- from the popup box then enable “unknown sources” option. -Then go back to the downloaded files folder by tapping the back button. -Then tap on the “Google Account Manager 6.apk” then tap install -> next -> done. -Again install the Quick Shortcut Maker.apk. -Tap on the “Quick Shortcut Maker.apk”. -Then tap on the “Quick Shortcut Maker.apk” then tap install -> next -> Open. -Once open the “Quick Shortcut Maker.apk. -There tap on the “Input Keyword to filter” tab. -Now type and search “Google Account Manager” from there. -Then, tap on “Google Account Manager”. -Then a “Sign In” browser will open. -Tap on the “3” dots from the top right corner of your device screen. -Then there you will see “Browser Sign in” option from there. -After that, Reboot your Samsung G6100. -Once Power on your device set up your device. -Done, Now you have successfully bypass Google FRP Samsung G6100. Thanks for visiting us, Comment below if you face any problem With bypass Google FRP Samsung G6100, we will try to solve your problem as soon as possible. you can check other some tutorial here to help you.